candidates apply for these JRHMS Medical Officer Vacancies through directly for certificate verification. Certificates verification will be held from 06-11-2017 to 10-11-2017. Cutoff date for age is 01/August/2017 and for qualifications is 30th June 2017. JRHMS will conduct certificate verification and interview to select the candidates for Medical Officer vacancies. 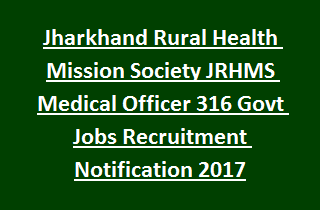 Further information regarding Jharkhand Rural Health Mission Society (JRHMS) Recruitment 2017 MO jobs see the below mentioned details. Total no of MO vacancies available in JRHMS Recruitment are 316 posts. Post Name: Medical Officer : 316 posts. -Must have qualified MBBS with Compulsory Internship for MO Jobs. - Ayurvedic Doctor: BAMS/ GAMS Qualification with complete Internship. - Homeopathic Doctor: BHMS/ DHMS Qualification with complete Internship. - Unani Doctor: BUMS/ GUMS Qualification with complete Internship. For general candidates age limit should be 45 years as on 01/August/2017. For BC- I/ BC- II is 37 years. For BC- I/ BC- II/Unreserved Female candidates age limit is 38 years. For UR candidates is 35 years. For ST/ SC is 40years. For PH Candidates will be given 5 years additional age relaxation. Certificates Scrutiny and Registration dates and time is 06-11-2017 to 10-11-2017 Time: 10:30 AM to 11:30 AM. Candidate selection for these Jharkhand JRHMS Medical Officer Recruitment is based on certificate verification, merit in educational qualifications and interview. Eligible candidates can download application form from Jharkhand JRHMS Website http://jrhms.jharkhand.gov.in for Medical Officers Jobs. Fill all the details and attach the necesary documents. Along with original documents candidates have to attend the Certificate verification and registration from 06-11-2017 to 10-11-2017 time 10:30 AM to 11:30 AM.